I call it a Mini-MMORPG-TD-RTS-PVP game. while back, a Warcraft III mod was created called Defense of the Ancients. It became an international underground sensation that took the world of competitive game mods by storm. But in the end, it was still just a mod. A few years ago some very bold DotA contributors decided it was time to take this genre-breaking game beyond the realm of Battle.net and make a standalone version. And that is how League of Legends was born. Wikipedia.com calls it a Multiplayer Online Battle Arena. I call it a Mini-MMORPG-TD-RTS-PVP game. But regardless, League of Legends is the streamlined next generation of DotA. In the game you play sessions as a summoner who controls a champion, a person or creature that fights other champions. The more sessions you play, win or lose, the more experience you earn to unlock features and spend ability points in a talent tree that affects every character you play. You play sessions as a summoner who controls a champion.There are about 40 champions to choose from, a free version of the game offering a smaller number. 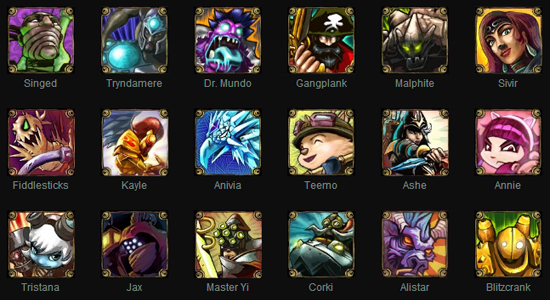 The types of champions range in such a variety that there are no two that are exactly alike in terms attributes and abilities. All the basic RPG classes are there: tanks, casters, assassins, healers, and combinations in between. A normal game consists of two teams, either 3-versus-3 or 5-versus-5, and teams start at opposite corners of a map at their respective bases. Connecting the bases across the expanse are "lanes" where towers are stationed. The point of the game is to protect your base and prevent the enemy team from destroying towers, all while trying to destroy theirs. It makes for a sometimes tedious back-and-forth battle that can last from 20 minutes to as long as an hour. If there is one rule to follow in this game, it is to do your homework. Learning about each champion is time-consuming, but it's that or learn the hard way. On top of that, there are items that can be purchased for stat bonuses. That plus leveling your champion can tilt battles in your favor, so really knowing your champion and what items to build it with make all the difference in the world. Players who are new to this amalgam of genres should be warned that the learning curve is insanely steep, so take wins and losses with a grain of salt. This game attracts players of a highly competitive nature, which means practice games are your saving grace. Thankfully, Riot Games has called upon veteran players to do the good deed of helping out the new kids by hosting tutorial games or just being a pal and giving helpful advice when necessary. Look familiar? It all started with a Warcraft III mod.I would say the experience is like any other game where you might have a stranger on your team, but it is really like playing a pick-up game of basketball at the park. You may not know your team but that is a huge factor when considering coordination and communication. I have enjoyed playing this game with friends, but needed a few hours of playing to get the hang of it. Thankfully there is a very helpful tutorial to explain the little nuances. And, too, there is a free version for anyone who might enjoy taking the time to really play it for all it's worth. There will be a retail version that gives you 20 unlocked champions, whereas the free version will require them to be unlocked over time. One thing veteran players will notice is that League of Legends is in no way a DotA clone. Some features were decidedly removed; however, new ones have been added that would never have been possible in a Warcraft mod. If anything, it will provide a refreshing change of pace to those who already spend hours battling to defend their base over and over again. Me? I find this game to be fun and very satisfying. The content itself feels polished and original, and despite a few new features that are not available at the moment it is very complete. I recommend it for anyone up for a new challenge, or even for old time DotA players who are looking for something new. I've wanted to try League of Legends! It sounds like it's a really neat game, even though I'm not too much into PvP. If you decide to play it, let me know! It is definitely a fun game to play with friends.